The Municipality of North Grenville Parks, Recreation & Culture Department maintains kilometres of recreational trails that complement our growing system of parks and open space. These trails enhance recreational opportunities for our residents & visitors and allow them to enjoy a cost-effective way of keeping physically active while enjoying the great outdoors. For auto and boat travelers, North Grenville is a partner on the Rideau Heritage Route. 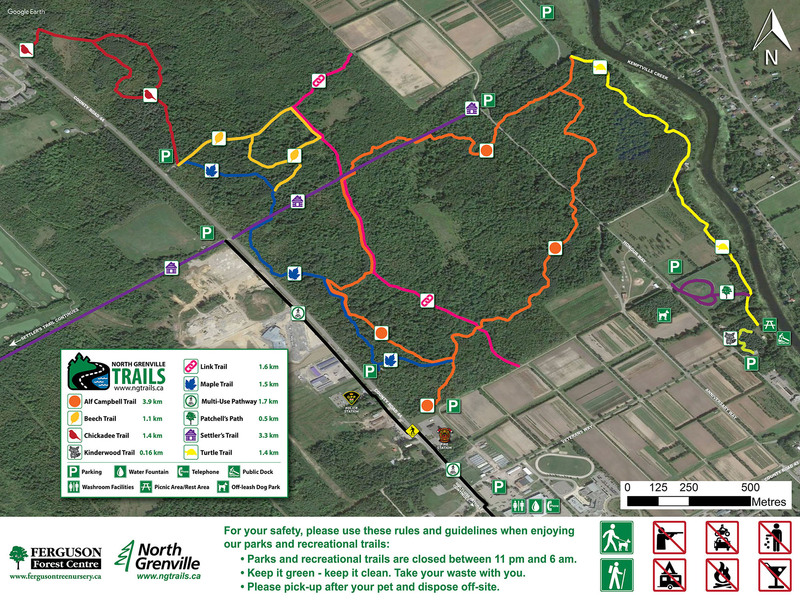 Why should YOU take advantage of North Grenville Trails? Available for day outings, year round. The North Grenville Integrated Community Trails Strategy developed in 2011 proposes improvements and expansions for North Grenville’s recreational trail system. Click to see Ferguson Forest Trailhead Map. Alf Campbell Trail is a 3.9 kilometre loop trail located within the Ferguson Forest Centre. This recreational trail has incline throughout the trail, but is flat in most areas. Alf Campbell Loop passes over some forest roadways, so be cautious of motorized vehicles. Parking is available at the trailhead north of the firehall within the tree nursery. Beech Trail is a 1.1 kilometre loop trail located within the Ferguson Forest Centre. This recreational trail has incline throughout the trail, but is flat in some areas. Beech trail connects to Link Trail for a short distance. Parking is available on the East side of County Road 44, between Settlers Trail and eQuinelle Golf Course. Chickadee Trail is a 1.4 kilometre loop trail that offers beautiful wooded scenery within the north side of the Ferguson Forest Centre. This recreational trail has incline throughout the trail, but is flat in some areas. Parking is available on the east side of County Road 44, between Settlers Trail and eQuinelle Golf Course. Kinderwood Trail was conceived as a woodland trail, acquainting children with the forest animals and their habitats. Kinderwood Trail is a 160 metre linear trail and good for all skill levels. This recreational trail is flat with a natural forest surface. This trail is located in North Grenville’s Anniversary Park within the Ferguson Forest. Parking is available on site along with a picnic shelter and public dock in the warmer months. Link Trail is a 3.2 km out & back trail (1.6 km each way) and good for all skill levels. This recreational trail is mostly flat with minimal incline. Link trail connects to Beech, Settler’s, Alf Campbell and the Ferguson Tree Nursery. Located along the south west side of the Ferguson Forest Centre, Maple Trail is a 3 kilometre out & back trail that offers the chance to see local wildlife. This recreational trail is relatively flat, with incline throughout the trail. Maple Trail connects to Alf Campbell Trail for a short distance. Parking is available on the east side of County Road 44, between Settlers Trail and eQuinelle Golf Course, or across from the OPP station. Patchell’s Path is a 0.5 kilometre loop, good for all skill levels. This recreational trail is flat, and has gravel around the length of the trail. Parking is available north of the path off Honour Way. Settler's Trail is a 6.6 kilometre out & back trail, good for all skill levels. This trail runs from the Settlers Grant community through the Ferguson Forest Centre. This recreational trail is relatively flat, with some incline and has gravel across the length of the trail. Parking is available on the west side of County Road 44, north of Kemptville Public School, or at the east end of the trail within the Ferguson Forest Centre. Located within the Ferguson Forest Centre, Turtle Trail is a 2.6 kilometre out & back trail along the west shore Kemptville Creek. This recreational trail is relatively flat, with minimal incline and has a natural surface across the length of the trail. This trail is good for all skill levels. Parking is available at Anniversary Park. Kemptville Multi-Use Pathway is a 4 kilometre heavily trafficked out & back recreational pathway located along County Road 44. The trail is primarily used for walking, running, and road biking and is accessible year-round. This multi-use pathway links Settler’s Trail to the North Grenville Municipal Centre. Keep in mind the proper use of the pedestrian crossovers is the responsibility of all users. Click here for the informative PDF on pedestrian crossovers. Passing through Curry Park, this beautiful pathway along the north shore of the Kemptville Creek connects Old Town Kemptville to Clothier Street East. This recreational trail is relatively flat, with some incline and has a combined gravel and natural surface. This linear trail features a number of historical plaques to read (coming soon!). The North Grenville Rail Trail is a 7 kilometre out & back trail that is good for all skill levels. This recreational trail is mostly flat with minimal incline. This trail provides access to a number of Kemptville neighbourhoods, and passes through Kemptville Campus. Parking is available at the south end of the trail off Bedell Road, however there are trail entrances throughout the length of the trail. Libby Island has a 0.5 kilometre lightly trafficked loop trail located on the Rideau River. This trail is primarily used for hiking, walking, nature trips, and birding. This recreational trail is mostly flat with minimal incline. Parking is available on the island, but be cautious of driving over the causeway after a heavy rain. 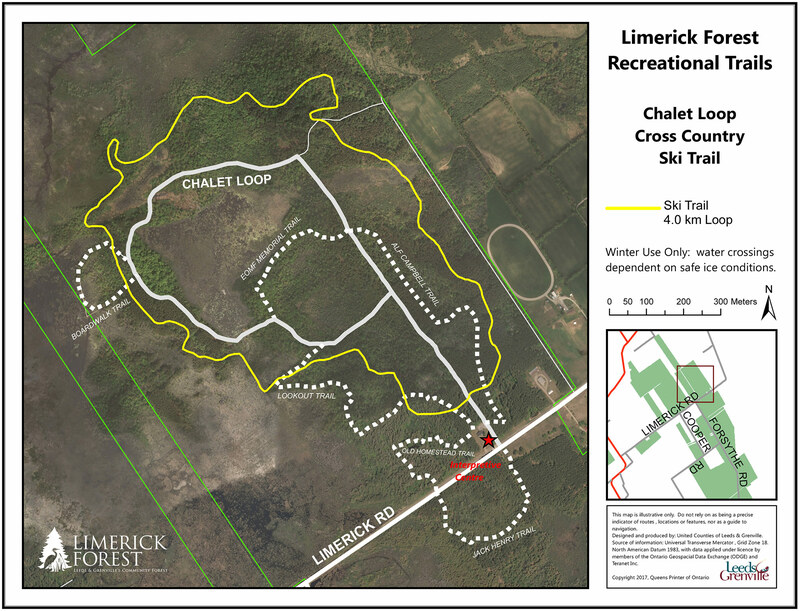 Chalet Loop is a 3 kilometre loop located within Limerick Forest South, which offers the chance to see wildlife, wetlands and scenic views along the boardwalk. Parking is available at the chalet off Limerick Road. For more information on Limerick Forest Trails visit www.limerickforest.ca. This trail is a fun active connection through the wooded area between soccer and ball fields at South Gower Park. The trail includes an obstacle course challenge designed by local children in partnership with Sinking Ship Entertainment’s TVO show: Giver. See ExploreNorthGrenville.ca for cycling route suggestions. Download N'Go PDFs or view slideshows of our Heritage Walking Tours here. Thank you to the following funding for helping to create our trails into what they are today! Please enjoy our North Grenville Trails video. Special thanks to co-op student Sydney C. from St. Michael's Catholic High School and to local resident Phil M. for the cycling footage.